Quite often, I can tell what time it is by visiting Wal-Mart. Currently, the time is Easter. You can tell by all the bunnies and eggs and spring-themed decorations. Dresses and suits for kids are at the front of the clothing section. The seasonal store displays are full of candy, baskets, and everything else you’ll need for Easter. It’s a time to celebrate the resurrection of Christ! But soon the time will change. On April 2, or perhaps even on the evening of April 1st itself, the shelves will empty of candy and baskets. The Spring-themed decorations will come down. Endcaps with seasonal items will change. In their place, like clockwork, will go cap and gown decorations, gift ideas for your favorite graduate, party supplies for your graduation party, and the endcaps will feature books about finding and living your dreams like “Oh the places you’ll go” by Dr. Seuss. Right after Easter, the time will change. We’ll go from celebrating the risen Christ to celebrating the arrival of dreams. I like to dream. I dream frequently. Those of you with leadership here at the church know that because I come to you all the time with ideas. I’ve been asked to stop running because I get too many ideas, have too many dreams, while making my circuit in the neighborhood. I have a friend who says I operate on the 70/30 rule: seventy percent of my ideas are alright to awesome and thirty percent are absolutely terrible. I’m an ideas guy, some have called me a schemer in the positive way; but regardless, I’m a dreamer. And, for much of my life, I went confidently in the direction of those dreams. It’s Palm Sunday. It’s the day we remember Jesus’s triumphal ride through the eastern gate into Jerusalem, fulfilling the dream of the prophet Zechariah. His arrival stirs the people of Jerusalem into a response. They’ve heard of his works in the surrounding countryside, they’ve heard of his miracles, they’ve heard of his teachings that give the common people hope. And now, their folk hero is finally visiting Jerusalem! They’re so excited by this that they throw him a ticker tape parade. Just like our victorious heroes who ride through New York City with ticker tape falling, Jesus rides through Jerusalem with palm branches waving, the colt riding upon a red carpet made of everyday clothing. In our modern ways of speaking, we might say Jesus is living the dream. Today is Palm Sunday. A day of triumph, a day of victory, a day of celebration. But today is also Revolution Sunday. That’s exactly what has Pontius Pilate worried. From his headquarters in Caesarea Maritima on the Mediterranean coast, not far from Jerusalem, Pilate worries each year when the Passover comes. Jerusalem swarms with tens of thousands of pilgrims who have come to the city for this holiest of Jewish holidays, some of whom have ulterior motives. For there’s a revolution brewing in Jerusalem. We hear echoes of it in verse 10: “Blessed is the coming kingdom of our ancestor David!” That’s the dream of the everyday Jew who’s been waiting for the Messiah to arrive. This Messiah would be a political savior, an ancient version of an Abraham Lincoln, full of morality and clarity of purpose who saves the people and makes them a great nation. They’re waiting, eager with anticipation, for political autonomy from the Romans and the establishment of a new Kingdom of Israel under a descendent of David. On this Palm, Revolution, Sunday, to the Zealots, Jewish leaders, and the everyday folk, Jesus looks just like the man to lead a political coup. On the streets, the talk is all of revolution. What will Jesus do? When will he throw off the Romans, regardless of the means? Like eighteenth century Philadelphia and Paris before the American and French revolutions, Jerusalem is a hotbed of activism. In the bars, the coffee shops, the huddle houses, the frozen beans of ancient Jerusalem, no one can talk of anything except revolution. Pilate knows this and executes his own plan out of his own dream of control of Israel and Jerusalem. Like the North Korean military parading around Pyongyang in a show of force, Pilate marches in the western gate of Jerusalem in full military dress, riding a stallion, a legion of soldiers marching behind him with red banners on gold posts, the signs of the Roman Empire. For an easy visual, consider the grand military parades of the Nazis. Hitler styled them after Roman military parades, exactly the kind of parade Pilate brings in through the western gate of Jerusalem. And Pilate’s point to the people of Jerusalem is clear: any attempt at revolution will be brutally suppressed. Problem is, this particular year, as Jesus marches in, Pilate gets upstaged. 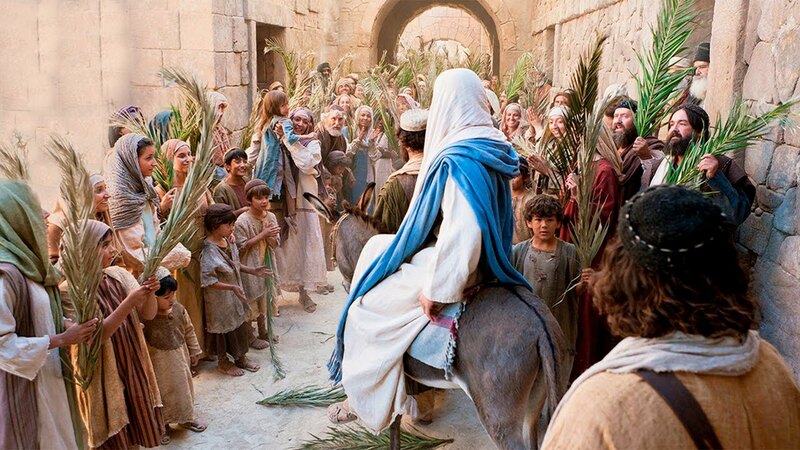 On this Palm Sunday, this Revolution Sunday, Pilate marches into Jerusalem through the western gate at about the same time Jesus rides in through the eastern gate. The earthly ruler marches in through the western gate with full military might and all the pomp and circumstance of the greatest empire the world had ever known; only to be upstaged by the folk hero, riding in on a colt through the eastern gate with no might, no pomp and circumstance, nothing fancy nor showy, but with the full support of the people of Jerusalem. It’s Jesus, not Pilate, that the populous celebrates. In through the western gate comes power and might to brutally suppress a revolution. In through the eastern gate comes a revolution of humility and love that will defeat sin and death, destroying their power forever. But no one, at the time, can comprehend that. Everyone: Zealot, Jew, Roman, has their own dream. They have gone confidently in the direction of their dreams. They are seeking to live the life they’ve each imagined. They are doing exactly what we encourage our graduates to do: dream big, seize what you want in life, work hard for the things that you desire. They’re no different than any of us who, laboring in our jobs, dream of a promotion or a bigger paycheck or a power base from which to craft our dreams. Or those of us, retired, who dream of finishing the work in our house or getting back to a position of health or completing that project we never had time for when working. Or those of us, still in school, who dream of the career we desire or to become popular and, perhaps, powerful in our schools. We all have dreams. We all go after those dreams, for they motivate us. I have dreams, too! This is just a part of being human. But dreams, like the dreams of the Zealots, the Jews, and the Romans, are just the problem. They blind us to the Revolution. Consider how blind the crowd is. This crowd that cheers on Jesus, proclaiming him their new king, eagerly expecting his deliverance and salvation, will turn on him. In just a few days, the crowd that today yells “hosanna in the highest!” will yell “crucify him! Crucify him!” From a king, they’ll come to regard Jesus as a common criminal, worthy of the death penalty. The Zealots and Jews of Jerusalem are so bought into their dream for the world, where Jesus becomes their political savior, that they’re blind to God’s dream, the real revolution of the Kingdom of God, being birthed among them. Or consider how blind Pilate is. He marches in through the western gate, pridefully believing he is in control, that he is all powerful, that he rules the day. He’s living his dream of regional conquest and power. In just a few days, he’ll stand before Jesus, a collision of earthly power with divine power, and the earthly power will condemn the divine to death. Pilate, worried about a political revolution, blinded by his dreams of control and power, is blind to the real revolution being birthed through Jesus. The Zealots, Jews, and Pilate are so convinced of their own dreams, their own vision, that they miss what God is doing among them; they miss the revolution. Today is Revolution Sunday. The question before us is the same as it was for the characters of our story this morning, the Jews, Zealots, and Pilate: are we blinded by our dreams? Are we missing the revolution? Thoreau, quoted so often at graduations and other moments of big dreams, says we should “go confidently in the direction of our dreams; live the life we’ve imagined.” I did just that earlier in my life. I had a dream of law school, and I went confidently in that way to live the life of social justice I’d imagined. But my dream blinded me to the revolution God was brewing within me: a call to ordained ministry. Living in Macon, I joined several community action agencies, hoping to gain power and prominence in Macon society. I went confidently in my direction of community leadership, to live the dream of local power I’d imagined. But my dream blinded me to the revolution God was brewing with me: a call to servant leadership. And as a pastor, I have dreamt many things. I have great and wonderful thoughts that enliven my imagination all the time. But many are not of God; they’re not God’s dreams for the church, they’re not the way God is calling us as a church to participate in the revolution. And so I’m prayerful, constantly, of what God’s dream, God’s desire, is for us, so that my dreams as your leader don’t blind us to the revolution God is brewing among us. For the revolution of love, peace, and hope that began through the humility of Jesus’s entry into Jerusalem continues to this day. God’s ways are far different from our ways; God’s call is unexpected and often confounding. But God has a dream for the world, a dream where all people live together in lives marked by love, peace, and hope. A world where justice reigns over all. A world where all people are in right relationship with the God who created them in the first place. That’s the dream. That’s the revolution we celebrate on this Palm Sunday. We, in churchy language, call it the Kingdom of God, the Kingdom Christ brought to the world through his death and resurrection. But consider how different it is from how we usually think of Kingdoms or any other political entity. It has no military, it has no territorial boundaries, it does not base itself on power; no, it’s grounded in humility, lived out through churches and individuals who’ve given themselves to Christ, and it’s chief characteristics are unconditional love, a peace that passes all understanding, and a hope that dares to defy despair. Perhaps best put, earthly powers and principalities use forces of various kinds to push their agenda for what they believe to be right. They want to cajole people into believing what they believe as they seek to fulfill their dreams for their kingdoms, their countries, and the world. Christ calls on us to have more humility than that, ushering in an invitation, not a command; using love, not force, to bring all people into himself. A Kingdom that doesn’t use power, but rather invites? A Kingdom that spreads it’s message not through force but rather through peace? That’s the Kingdom of God, that’s what Christ brought through his death and resurrection; that’s the revolution, for the Kingdom of God is nothing short of revolutionary. This is the dream. This is the revolution. And we are called to be co-laborers in it. Christ brought forth a revolution: that not by might, nor by power, but by the Spirit of love, peace, and hope, will the world be saved. Christ is indeed a savior, but he will never be a political savior, he won’t force his revolution upon people, he will not be cajoling, for that’s not the way of things. Rather, we’re called, through our church and through our lives, to be so loving, peaceful, and hopeful that folks around us come to know Christ through the Holy Spirit that lives in us. We have tremendous opportunity, both collectively and individually, to be co-laborers in the dream, bearing witness that the Kingdom of God is here and now such that all people can know the love, peace, and hope that Christ brings. But all too often, our dreams get in the way creating that world. That’s the difference between the arrivals of Pilate and Jesus, that’s the difference between the eastern and western gates; that’s the difference in joining the revolution and being blinded to the revolution; that’s the difference that matters this morning: the difference between choosing dreams for ourselves or asking God to give us our dreams. None of the dreams I mentioned are necessarily wrong; they’re only wrong if we haven’t asked God if they’re the right dreams, the dreams God has given us, that will cause us to further the revolution of love, peace, and hope, bearing witness that the Kingdom of God is here among us today. Consider the opportunity Jesus has here on this Palm Sunday to seize the political Revolution. The crowd is with him and for him. He could rally them, call them to throw down their Roman overlords, and establish himself as the new King. Sure, a battle would ensue, there’d be blood, but the people are ready. Jesus could have avoided the cross and the tomb by seizing upon this revolutionary moment, taking the power and prominence the crowd offers him and using it for political purposes. But Jesus doesn’t do that. He chooses instead to live out God’s dream for his life: marching toward the sham trial that he knows will be humiliating, riding his colt toward the abuse he’ll suffer at the hands of the Roman legion, hearing the praise of the crowd who will taunt him while he dies the horrific public execution of crucifixion. He lives out God’s dream because he knows that the revolution God is brewing will be far greater than anything he could accomplish on his own. So it is for us. The revolution God wants to bring about through our lives and through our church for Eastman and Dodge County is far greater than anything we could imagine on our own. The revolution for our families, for our workplaces, for our community organizations, for ourselves in our interior life, is far greater than anything we could imagine. God wants to bring the Kingdom to bear through us, not through might, nor through power, but by God’s Spirit! We have the chance to participate in that! We can be co-laborers in the Revolution, bring to bear the Kingdom of God for our neighbors. Seems the graduation gifts and cards are wrong. Thoreau was wrong. We cannot be anything we want to be, we cannot pursue any dream we desire, we should not go confidently in the direction of our own dreams, nor should we pursue living the life we’ve imagined. I know that’s a radical notion, but we cannot simply pursue our dreams, whatever they may be, no matter how significant or insignificant they seem. We cannot because we are not our own, we belong to God, because of what God did through the crucifixion and resurrection that will be upon us this week, and thus our dreams must find their inspiration not in our pride, but in our relationship with God. And so, we have a choice before us: to ride in the western gate or the eastern gate; to enter into the activity of this world pridefully, like Pilate, or humbly, like Jesus, submitting our dreams to God. We have a choice of whether or not we will pridefullly carry the burdens of our many dreams, or submit our dreams to God’s dream for the world, choosing to allow God to give us our dreams. On Palm Sunday, God began a revolution. As Jesus marched toward his own crucifixion and resurrection, God revolutionized sin and death, destroying their power forever. Through Christ, God gave birth to a new Kingdom, called the Kingdom of God; a revolutionary constituency in which peace, love, and hope reign above all else. The revolution, God’s dream for the world, became real and remains real today, for it’s the battle cry of the church as we march forward through the ages to bring love, peace, and hope to all. This morning, will you cede your dreams to God’s dream for your life? Will you join the revolution? Consider your many dreams: are they God’s dreams for your life? Begin today, and don’t delay, to ask God if your dreams are his. And if they’re not, be brave to ask God to inspire your dreams and then choose those. Consider, too, your role here at the church. Are you doing all God has called you to do for our church? The church is the outpost of the Kingdom of God in the kingdoms of the world. This is the primary place to give of your time, presence, gifts, service, and witness so that, through you and through our church together, Dodge County may become a place known for it’s love, peace, and hope that trump all else. For you are invited this morning to join the revolution, becoming a co-laborer in bringing about the Kingdom of God on earth. Accept the invitation. Stop marching pridefully through the western gate. Choose, with humility, to march with Jesus through the eastern gate, joining in the work of the Kingdom. Dodge County can know love, peace, and hope above all else; our neighbors can known the salvation God provides through us, if only we will set aside our dreams to follow God’s dream for our lives. So, on this Revolution Sunday, cede your dreams to God’s dreams for your life. On this Palm Sunday, join the revolution.